Den Juyongguan-del af Den Kinesiske Mur behandler besøgende til lyse skarer, fantastisk udsigt og gamle templer, alt inden for en kort køretur fra Beijing. Tour denne del af muren med en privat vejledning for at lære om dens store fortid, og fortsæt derefter ned på den hellige måde og de kejserlige grave på Dingling. Denne tur inkluderer rundturstransport fra dit hotel og en traditionel frokost. 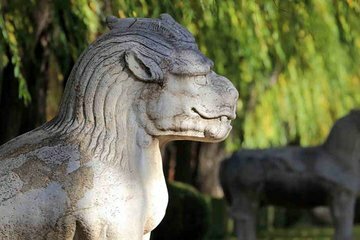 This is a wonderful tour for anyone who wants to experience the ancient history of China. But the tour was made worthwhile by my outstanding tour guide, Angie. She was not only knowledgeable of the area but was able to put the sites within the timeline of Chinese history in an understandable way. If there was something she was not sure of she would look up the facts to provide the most accurate information--unlike some tour guides I experienced. If you are lucky enough to take this tour, insist on having Angie as your tour guide. The tour began at 8:30 a.m. with the Juyongguan section of the Great Wall. This is a popular location that is quite busy and commercialized but the scenery was very beautiful. We then began the first part of the tour of the Ming Tombs that included a wonderful and peaceful stroll down the Sacred Way. Lunch was enjoyed at one of the most beautiful restaurants that I visited in China with entertainment, wonderful décor and delicious food. Finally the day closed with a visit to the underground tomb of a Ming emperor. The tour was wonderful and well worth the money. The tour guide, Angie, made it a great experience. Maria was an excellent guide for us on our tour . Low key, fun but with interesting knowledge to share she was a perfect match for us as non your kind of people. The full day she sorted and we shared a great lunch that was really delicious - not westernized ! Thank you Maria and Wikibeijing ! Instead of being packed onto a bus full of 49 other tourists to be schlepped off to the jade factory for 2 hours and the Great Wall for 30 minutes, I chose to go the private tour route. I'm glad I did. I've been to Badaling before, but I think Juyongguan is nicer. The Wall here is a loop, and encircles the road that comes through the pass. There was no separate stop for shopping, which was as advertised, but we did request a stop at the gift shop for a cold beverage and so we could pick up a few souvenirs. Our guide called in sick, but the company owner showed up only about 2 minutes after the appointed pick-up time to lead the tour himself. Everything was as expected. Lunch was at a decent place. Our guide joined us for lunch, so we were able to continue or education as we dined. For the two of us we were provided with a driver, guide, and minivan. This was a trouble-free tour.